If you saw my skincare video aimed at those with eczema, you might've remembered me mentioning my sister visiting a herbalist... well that herbalist now has his own line of incredible teas. Its been so lovely hearing about the company via people at home in the UK and slowly seeing them more and more in the US, including at our local coop in the middle of nowhere. Pukka Herbs are certified carbon neutral, 100% Organic and non-GMO and have an incredible story you can find out about here. I love green tea and drink it almost daily but i've never found a Matcha tea that i really liked and always found them to have an air of the ocean about them... not in a good way either. That is, until i found this tea. I like to have a cup of this in the afternoons to give me a little boost without reaching for the coffee. The back of the box says it replenishes magical powers and I wouldn't disagree with that. If ever i'm feeling a little flustered or just unfocused and need to destress, this is the tea i reach for. The chamomile and lavender are such a nice relaxing combo and the rose is meant to fill your heart. While you might not necessarily believe in the power of tea... just give it a go. Stop and take a moment to appreciate your cup of love and you never know how it might help your soul. This is another one great in the afternoons or at the end of a frustrating day. Its meant to lift your spirits and provide clarity with its blend of holy basils. It almost smells like a savory tea at first but the taste is something i've never experienced before. Very soothing and easy to drink yet energizing at the same time. Not only have i found this to be the perfect accompaniment to my pre-bed bath or shower but i've also found it settles the stomach and stops me from reaching for midnight snacks too. The lavender is very mild but effective and the oat flower really is so soothing. If theres one night time tea i'd recommend, this would be it! It does contain licorice root but as someone who can't stand that taste, i really can't even detect it. 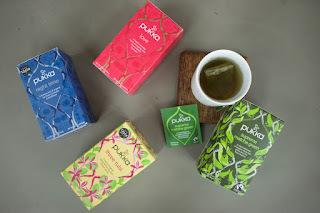 Check out Pukka Herbs website for more info and find out what your "body-mind type" or dosha is here.